We warmly welcome you to our apartment in the beautiful setting of Vila Sol Five Star Spa and Golf Resort, recently acclaimed by ‘Golf World Magazine as one of the top ten golf vacation resorts in Europe. Whilst golfers will relish the challenge of the famed 27-hole Vila Sol championship course, this fabulous location is ideal for all the family with swimming pools for adults and the children, tennis and ball courts. Reasonably priced meals available at the golf course club house only a few metres away. Vil Sol is superbly located with long sandy beaches, excellent Aqua Park and the famous Vilamoura Marina with lots of interesting shops and restaurants to suit every taste only a few minutes drive. There are lots of charming and historic places to visit and Faro Airport is only a 20 minute drive from the apartment. As a retired Chief Executive we bought a top grade apartment which we would enjoy staying in to soak up the Algarve sunshine and visit all the interesting places in the Algarve. We would love to share our villa with you and your family and friends. Both bedrooms have the benefit of en-suite facilities including shower, wash basin, toilet and bidet. This luxurious apartment is decorated and furnished to a very high standard with air-conditioning, large open planned living/dining room with large screen TV and DVD. Leather sofas, one of which converts to a bed-settee. Sliding doors open onto patio. High quality electrical equipment including, cooker, hob, fridge, freezer, toaster, microwave and dishwasher. High quality fitted units along with fine china crockery and good quality cutlery. The apartment is situated in Vila Sol Village adjacent to the internationally famous Vila Sol 27 hole Golf Course with 40% discount on green fees with our owners card, the clubhouse is just a few metres away. There are many excellent golf courses in Vilamoura within 10 minutes drive and in Quinta do Lago within 20 minutes drive. Please note we are a first floor apartment. Notes on accommodation: Free WI-FI Internet Access is available, just bring your own laptop. The apartment has full air-conditioning / heating in all rooms. Outside: Lots of out-door space, the sunny balcony for your BBQ and alfresco meals under the electric awning, what better way to start your day than breakfast on the balcony overlooking the landscaped gardens, tennis courts and golf course. During the day relax on the huge private sun terrace, fully equipped with loungers, sun awning and comfortable chairs and table for that refreshing drink to help soak up the warm sunshine. Special deckchairs to take alongside the swimming pools are also provided. Utility Room: The utility area has a washing machine, tumble dryer and clothes airer. Ironing board and iron are available. Cleaning / Towels / Linen / Maid service: Linen/towels are provided, also those for pool/beach. A mid clean including bedding, & towels can be arranged for a fee of £85. Stay for14 nights & a mid-stay clean is provided free of charge. Cleaning charge is made on bookings of less than 6 nights. Other: Large sunny balcony with sun awning and views over the pools, gardens and tennis courts is ideal for alfresco dining. From the balcony there are steps leading to a an even larger private roof terrace, where one can bask in the Mediterranean sunshine. 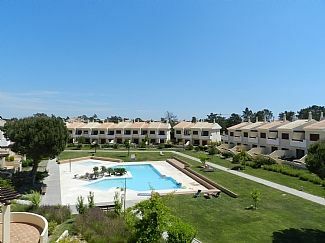 Beautiful and great apartment in a lovely area in Algarve. We stayed 5 days in July and we all loved it. The apartment was great and the where lots of outdoor space. Carol took good care of us when we arrived and everything was very nice. Many thanks B. for the review. We look forward to having you stay in the future. Enjoyed a great 10 day holiday in this fabulous apartment. Very well equipped with everything you could want - even inflatables, buckets and spades and body boards for the children! Beach/pool towels also provided so no need to take your own. Numerous DVDs for children and adults alike with British tv via the internet. This immaculately clean apartment was exactly as described with a great view of the pool so you can keep an eye on the children from the spacious balcony or roof terrace if you so wish. The easy to clean gas BBQ was put to good use as was the jacuzzi bath by my 9 year old daughter. The air conditioning came in very useful when we had a few days of unseasonaby hot weather! We hired a car for 4 days and used "Minatours" taxi firm for the remaining days. This was the firm that Richard (the manager) booked for our airport transfer. They were reliable, on time and very helpful recommending restaurants etc. they were also very reasonably priced. Lynn and Allan could not have been more helpful, answering our numerous emails and providing us with lots of information to help us make the most out of our stay. I would recommend this beautiful apartment in its' beautiful surroundings to anybody considering a holiday in this area! We will definitely return! It is a few mins drive to the Vilamoura beaches and marina and Quarteira beaches. Faro airport is situated only 20km / 20 minutes drive from Vila Sol. Our Property Manager, Richard Whitfield will show you the apartment, how the air-conditioning and all the electrcial appliances operate as well as lots of helpful advice. The Aqua Park which boast the largest wave pool in Europe is only minutes away. Quarteira 3km. Vilamoura 3km. Loule approx 8km. There is a traditional British style pub, an excellent international restaurant, bank and other amenities. Nearby, on the way to Almancil is the large Apolonia supermarket which carries British goods. Aldi and Lidl are also close by with a new Pingo Douce and Continent supermarkets. Local restaurants: Apart from those on site there are Portugese Restaurants close by. Their specialities include grilled fish on the bone, pork with clams (delicious), cataplana and grilled spicy chicken (piri-piri). There is also an Indian restaurant Natraj, 1.8km down the road towards Quarteira. Add on to this the large number of restaurants in Vilamoura and you are certainly spoilt for choice! Booking Notes: Please contact owner by either email or telephone to check availability. For your security and having English speaking assistance locally, our apartment is managed by our Property Manager Richard Whitfield. All bookings are accepted on terms and conditions which are shown on our website. Some conditions are: Deposit of 150GBP/180euros per week is required to secure your option. A refundable Security deposit of £200 is required. Changeover Day: Day of changeover is flexible. Check-in time 4pm and check-out time 10am.